Football Tournaments are a great way of developing young players in terms of widening their football experience and developing their social skills. Tournament football is quite different to weekly league and cup football competitions. The intensity of tournament competitions test the skills, fitness and endurance of schoolboys and girls of all ages. Below is a list of some of the more popular schoolboy / girl football tournaments in Ireland and further afield. If you are the organiser of a football tournament and would like to have your event included below please feel free to email Soccer-Ireland with the details. The Dublin Cup will be back for it's thirteenth year in 2015 and teams from far and near have already expressed their interest in taking part. The Tournament will take place over 3 days from the 31st July to 2nd August inclusive at the AUL Complex in Clonshaugh, Dublin. Location: AUL Complex in Clonshaugh, Dublin. 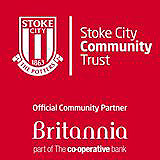 Topflight Soccer are teaming up with STOKE CITY'S Community Trust to bring a brand new international tournament to Stoke-on-Trent. Teams from around the world are already signing up to take part in the inaugural Stoke City International Cup over the Easter weekend. With the three-day competition to be staged at Keele University and open to Boys teams aged U10 - U16 and Girls teams age U13 & U15, it will provide the perfect opportunity for a squad of young players to test themselves against a broad range of competitive styles.